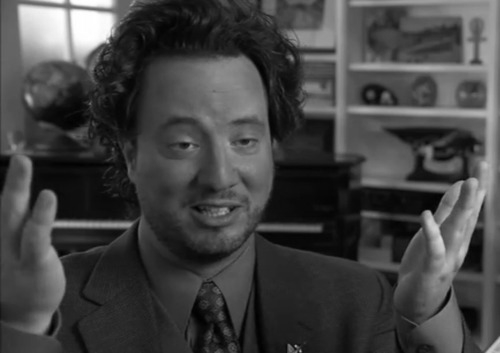 Giorgio Tsoukalos on "Ancient Aliens." My alien afternoon with Giorgio Tsoukalos. The dubious authorial accomplishments of Giorgio Tsoukalos. Giorgio Tsoukalos and the rules of evidence. Giorgio A. Tsoukalos was born in Switzerland in 1978, where he attended boarding school. In the 1990s, he immigrated to the United States to attend Ithaca College in Ithaca, New York, graduating in 1998 with a bachelor’s degree in sports information communication. He worked as a bodybuilding promoter in the late 1990s and early 2000s. Tsoukalos originally claimed that Erich von Däniken made him the director of the Archaeology, Astronautics and SETI Research Association, now called the Ancient Alien Society, upon meeting the young Tsoukalos in 1998, when Tsoukalos was just 20. Today, however, he claims to be the founder of the organization. In his capacity as AAS director, Tsoukalos began editing the society’s club newsletter, Legendary Times, leading to his sole publishing credential. As editor of the club newsletter, Tsoukalos claims to be the publisher of a magazine in his professional appearances. Today Tsoukalos claims to be the “author” of Gods or Ancient Aliens, a PowerPoint presentation. Tsoukalos parlayed this credential into frequent appearances on the History Channel, Discovery Channel, National Geographic Channel, and other broadcasting outlets in the early 2000s. His enthusiastic delivery, European accent, and willingness to say whatever producers needed allowed him to become “the world’s leading Ancient Astronaut expert” despite having produced no original research or writing of his own. He became a staple of the highly profitable alternative history lecture circuit and currently serves as the “star” and “consulting producer” of Ancient Aliens, the documentary series airing on H2, a position he has held since the pilot episode in 2009 and the launch of the series on the History Channel in 2010. In 2014, Tsoukalos became the host and producer of an Ancient Aliens spinoff, In Search of Aliens, which saw the ancient astronaut theorist travel the world to interview other fringe figures about their beliefs. Giorgio Tsoukalos holds a bachelor’s degree in sports information communication but does not hold or claim any archaeological or anthropological credentials. Tsoukalos makes few original claims of his own but rather presents the research and opinions of other ancient astronaut theorists. He argued Atlantis was a flying bronze disc that flew into the sky rather than sank into the ocean. He claims aliens “inspired” but did not build most ancient monuments. He claims Puma Punku is the only alien-built structure on earth. He believes granite, an igneous rock, can be created by pouring concrete or other sedimentary processes. Tsoukalos has repeatedly presented known hoaxes and demonstrable untruths as facts. He claims authorial credentials despite having published no books. Asks for guarantees of positive media coverage before agreeing to interviews.